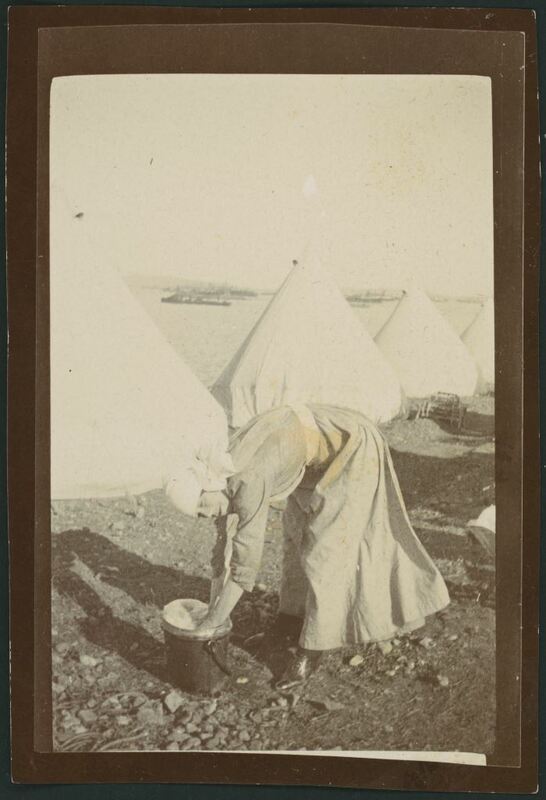 Sister Mitchell washing at Lemnos 1915. Anne Donnell, National Library of Australia MS 3962. Click on image to enlarge. Army nurses from the Hunter Valley served in France and Belgium (“the Western Front”), England, Egypt, Salonika in Greece, the Greek Island of Lemnos, India, on hospital ships and in military hospitals in Australia. The conditions of work and and off-duty time varied greatly according to the location. Military hospitals on the Western Front were vulnerable to air raids, especially the casualty clearing stations (CCS). The CCSs were both emergency departments and operating centres. They sometimes moved at very short notice depending on movements on the battle front. They were the closest to the war front that Australian nurses were allowed. Their role was to patch up the slightly wounded and return them to the field, to evacuate the more seriously sick and wounded to base hospitals once their condition had been stabilised and to ease the final hours of the fatally wounded. Accommodation for both nurses and patients in these forward hospitals usually consisted of a combination of huts and tents. Although exposed to danger on the Western Front and even in England, the nurses at base hospitals often enjoyed living arrangements comparable to at home in Australia. By contrast the nurses on Lemnos in 1915 had some of the worst living and working conditions of any women during the course of the war. The photo above illustrates the rough environment of No 3 Australian General Hospital. In Egypt and India there were the heat and the unfamiliar culture. In Salonika in northern Greece malarial mosquitoes were a problem and some nurses became seriously ill. These included several from the Hunter – Staff Nurse Lillian Braye became so sick she was repatriated early.